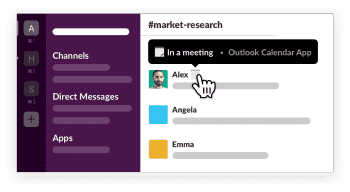 As team collaboration software and messaging solutions continue to grow, and new alternatives pop up on the market we always seem to find ourselves look back at Slack. And for good reason, as arguably the catalyst for this recent adoption trend, Slack has set the standard for how a team messaging app should look, and even to some degree how it should function. 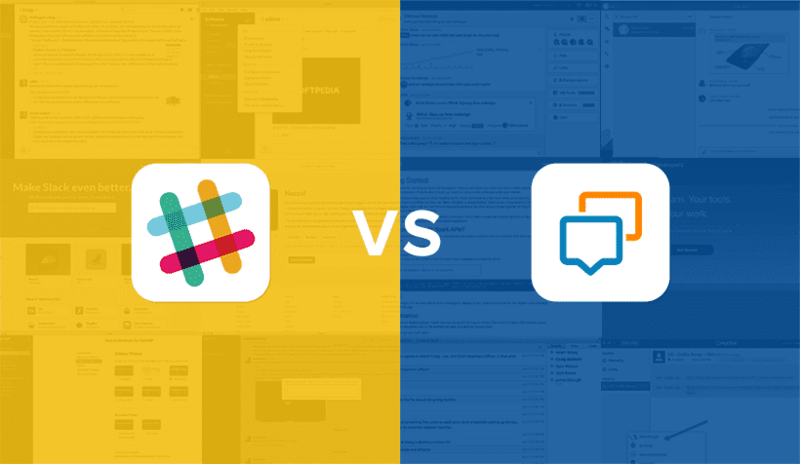 We’ve taken a look at a number of platforms, some direct competitors such as HipChat, others a bit of an apples to oranges comparison of Cisco Spark, and no matter the platform Slack still offers a solid benchmark by which to measure. Well here we are again, and this time we are taking a look at the Team Collaboration platform Glip. Design is really just a subjective opinion. However, when it comes to applications, design can influence more than just our emotional reaction as a painting would. In fact, design directly influences our experience with the platform. When it comes to Glip, they clearly took a page out of Slacks playbook – but then again who hasn’t. There’s no shame in that, I always say when it comes to design that if is not broken then don’t fix it. Get too creative with design and you can easily throw off users on first impressions – like my first take on Slack. However, when a paradigm is set it makes sense to follow, users have decided what they like and so companies will deliver that – which is what Glip did. They kept a very simple, and elegant approach. At this point its fairly redundant, but to break it down the left panel houses navigation, the middle is your context, and on the right is a collapsible panel called the Shelf to house your timely or important notes, messages, files or tasks. But that’s it, Glip didn’t add in an extra fancy bar on the left for even more navigation, which in turn might end up separating messages and other functions, or just create a confusing layout. With a clearly defined color scheme, Blue and White, Glip stuck with it and used color to separate sections very cleanly. Everything is both labeled with text, and a small icon to distinguish different sections, and its all in one location. I also enjoyed a consistent layout through out similar tabs, such as Notes, Tasks and Links so users don’t have to memorize multiple different layouts. At the end of the day, Glip sticks with a proven and simplistic design, with strong categorization of different features, yet while remaining a consistent design throughout. 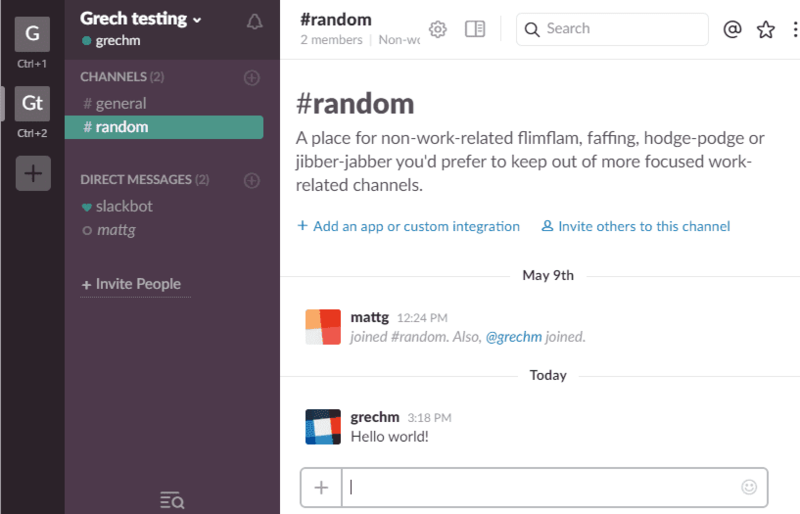 Slack has this style nailed down, of course, with a design that is both pretty yet simple. Personally, I still don’t understand some of the conventions Slack decided to employ (I understand a Hashtag is your logo, but do you really need to use that to distinguish different channel names? ), but the design has grown on me in my months of usage and I understand why simpler is better. Colors are great as well, even if the Standard slack choices aren’t my ideal. Overall, Slack does keep it simple – and if this seems very similar to Glip, well Slack was here first. 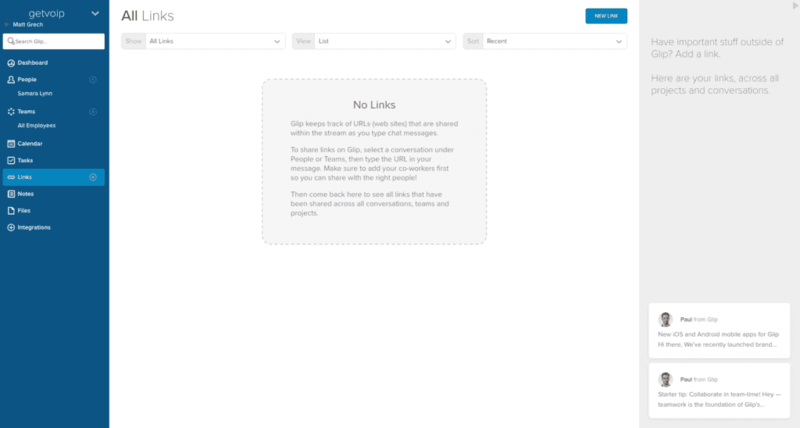 A left panel houses your chat Channels and Direct Messages, the middle panel is white and filled with content, and a collapsible right panel can display search results, files, directory, downloads and help. Color is used to distinguish sections, and the channel menu relies on text labels for sections, with # markings for channel distinctions as I already noted. Again, Slack is simple – yet I personally am not the biggest fan of the standard color choices, or many other options given for that matter – but of course that’s where Slack’s powerful customization comes into play. Winner: Glip – Now I’m sure many might disagree, everyone loves to praise Slack for its design and well, credit where it is due they are responsible for bringing this standard into the limelight. However, I enjoy Glip’s take, and minor improvement especially in stock form. Better colors, a simple blue and white theme, clear and simple menu icons and titles for navigation, no odd hashtag bullet marks. The user experience of an app can generally be thought of dictated by the design – if the design is simple and familiar, navigation will be a breeze and users will enjoy their experience within the app. Beyond the design, however, user experience will be dictated by a few factors, such as the functions available, the app’s organization, and navigation options – essentially, how many clicks it takes users to complete an action, as well just an overall feel when completing tasks. Customization is a huge plus as well, letting users tailor the experience to what works best for them. But when I switched to Glip, I never felt lost or confused – in fact I really enjoy the simple and categorized design. Nothing felt unnecessary in labeling, or over complicated in actions. A really nice added feature for users is the Dashboard, your login home screen. Since Glip is more than just messaging (it has built in task and project management) the user experience revolves around not just the quick chat, but the ability to plan your work day, or even week directly within Glip. We are all about seamless experiences, and Glip is one way to provide that experience by bringing together more than one function into the same app. 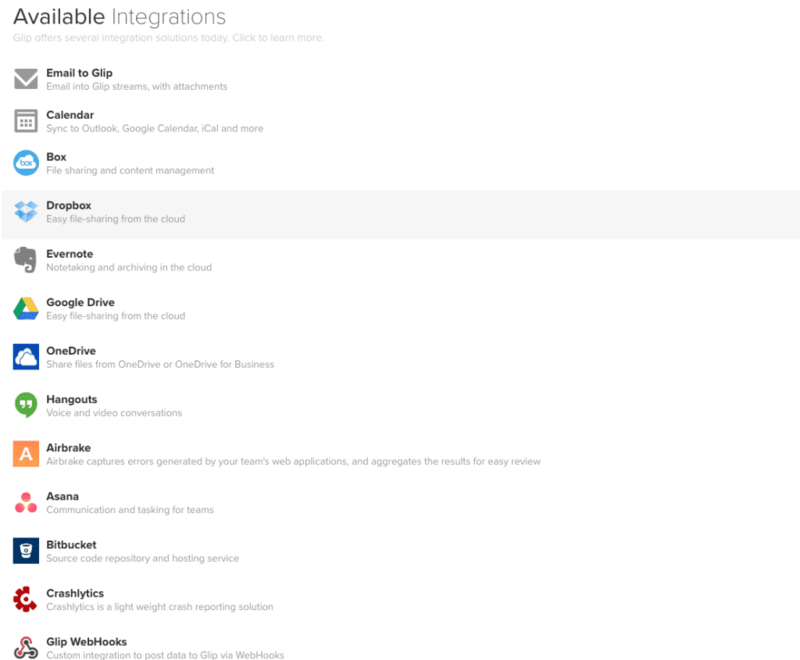 Who needs integrations when its all under one roof? In fact, that’s the same reason we felt Nextiva’s NextOS was so innovative. The act of messaging is pretty standard around all platforms, but even Glip manages to include what makes Slack so much fun – with an Emoji and Giphy button directly on the chat bar, users can easily sprinkle in that little bit of personality. Users can also like, favorite or pin a specific message to react at a glance or hold onto important notes. But the real power of Glip lies in the organization of the app, with distinct sections for each specific function – Messages, People and Teams to house your directories, Calendar, Tasks and even Links, Notes, Files and Integrations live in their own separate tabs. This use of categorization helps users stay organized and access what they need when they need it, really empowering collaboration. For example, managers can set Tasks and assign them to the proper user – when that user logs in for the day they will see in their Dashboard the week’s calendar for any important meetings or deadlines, and a list of open tasks assigned for the day. All of their coworkers links and files related to the project will also be included in their respective tabs. This organization continues with a more in depth Tasks section, a really handy Links section so you can never lose that handy graphic Dave sent you, and even Notes and Files. Notes are really cool as well, because they are living breathing documents that reside right in Glip. 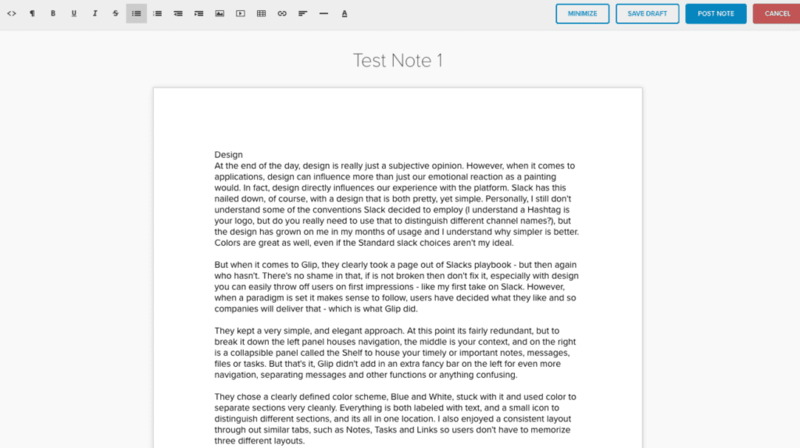 Essentially, its Google Docs, but right in Glip so you can very quickly and easily share drafts to be edited on the spot with other users in Glip. An added bonus are the drop down menus sprinkled throughout, letting users customize their experience and access some features on the fly. Slack generally wins in user experience comparisons, but Glip really is a solid competitor that holds its own. Slack, for a lack of a better explanation, just feels fun to use – bright colors, gif integrations, emojis, silly hashtags and chat bots living in your room, quirky pop ups for functions like dragging in a file to share, and friendly messages. All of these aspects add up to create a platform that just doesn’t feel like work, it feels like we’re in a group message on Facebook with our friends – but we are, or should be, getting work done. However, when you boil it down – Slack simply offers a messaging platform first and foremost. You can create specific channels for different teams and projects (or slacking off), and below channels Slack lists Direct Messages – their version of 1:1 chats. Slack does in fact provide specific sections to house all of your shared files, and even a company directory – but you need to dig through a menu on the top right of the app to get there, as opposed to Glip that puts it front and center in the navigation bar on the left side. Without any integrations however, Slack is missing task management, or a calendar built right in. And Slack limits your integrations if you are only on a free access account, an important distinction to keep note of. Slack was pretty revolutionary in adding gifs and emojis to work, in fact revolutionary in the idea that work collaboration can be as fun as messaging your coworkers. But competitors have caught on quickly, and the recipe isn’t a difficult one to both emulate or build off of – just throw in even more functions Slack doesn’t have. Of course, with too much in one it could get messy quick but Glip managed to nail it all down properly. Winner: Glip – At the end of the day, Slack is fun to use and will fit the majority of needs for small teams that just need a way to message each other, but even the smallest team can benefit from extra functions. When it comes to productivity, the need to track more than just conversation is important. 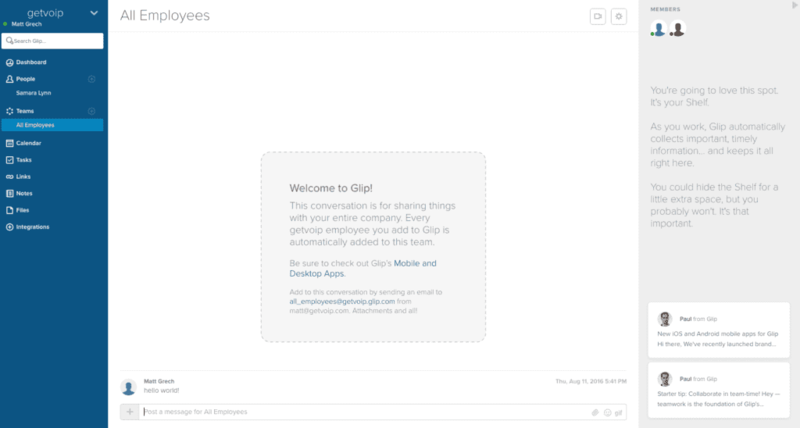 Glip seems like an improvement over a the basic messaging service provided by Slack, with a clean and organized design that makes it easy to use. Oh and Glip even has the gifs and emojis we all love. In all of our prior Chat Wars comparisons, customization is something that just about every platform seemed to lack in comparison to Slack. Glip, on the other hand is one of the few competitors we’ve taken a closer look at that can actually seem to hold its own, at least a bit more compared to other solutions. 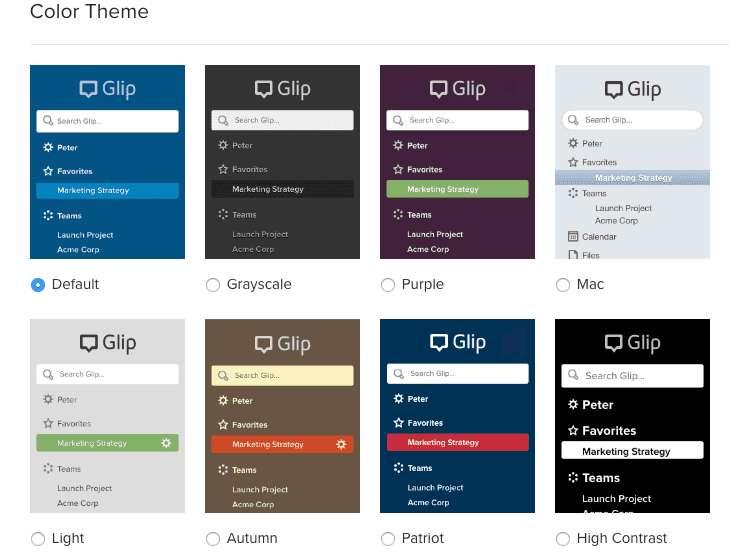 Again taking a note out of Slack’s playbook, Glip offers users the option to choose from eight different predetermined color themes. There’s the usual blue, some black and white, or some more unique color options, but you are limited to only these eight. Slack on the other hand, not only offers a number of themes but also the option to choose any color you want to truly create your own custom theme. So while Slack blows Glip out of the water for themes, it doesn’t end just there. We’ve seen other options with a wide range of sounds to choose from for notifications, and Glip checks that box as well. In fact, Glip allows users to choose from two different sound pools for different notifications, although I’d really consider this a minor addition compared to colors or themes. Not necessarily groundbreaking, but interesting nonetheless, giving users just a little extra boost to their customization with the option to consolidate clutter. Users can also decide between the maximum number of conversations to display, up to 60, a yes or no option to display the Team tab, default or compact message display, and even an option for top-down or bottom-up conversation threads. Finally, a competitor to closer rival Slack’s customization. While Glip manages to offer roughly an equal number of preset color themes, and even sound customization for notifications, Slack does in fact hold an edge in customization. With the added bonus of complete color customization, users can truly create a design theme all their own. Sure, the majority of us won’t even bother – but those that want to play around and create something that works best for them have the option, at least when it comes to colors. In fact, Slack really stresses customization – even with a “Customize Slack” function living right in the main menu. 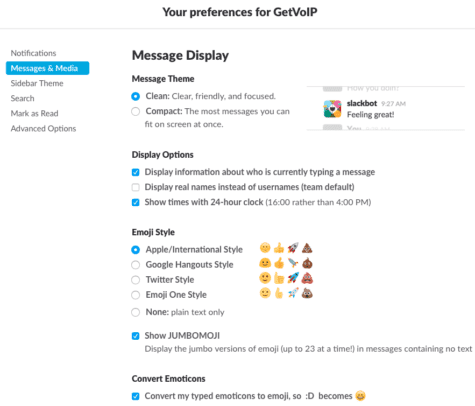 Users are directed to a webpage where they can then add in their own unique Emoji by uploading an image, customize the friendly Slackbot to respond to specific user messages, and even lets users add in their own custom loading screen text. None of this adds to the work functions, but its all good-natured fun and the captivating user experience that Slack is known for. Overall, Slack doesn’t allow users to customize too much in the way of functions, but then again there aren’t many functions in Slack that can be customized – all you get are message channels, and a few extras like a file tab and company directory. While Glip does a good job, it certainly isn’t the only alternative that does what Slack can’t. 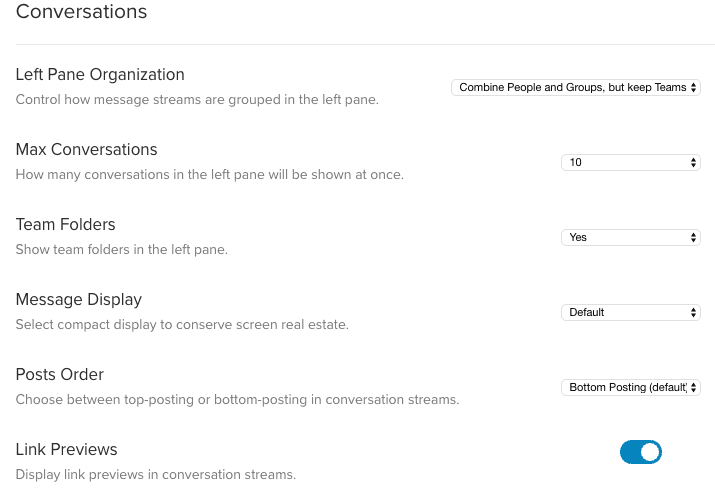 Worth noting, something I can’t seem to understand is that Slack doesn’t even allow users to drag and drop channels or direct messages to reorganize them – you can leave channels to reorganize, or star channels to move them to the top, but that feels more like a work around as opposed to a simple drag and drop function. Winner: Slack – This is without a doubt a very close section to compare, Glip does offer some very nice customization and even allows users to reorganize part of the platform. 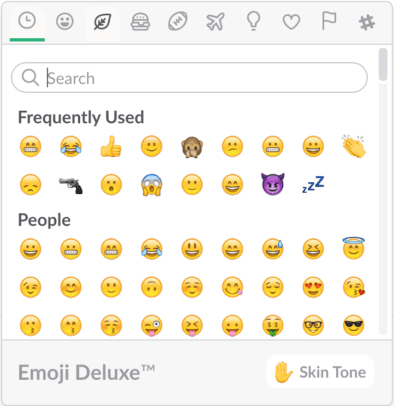 However, Slack still goes an extra step to offer even more customization, even if its just custom emojis, color themes and loading messages. At this point, you simply cannot develop a messaging app that does not send users notifications – it would defeat the purpose. And of course all apps will deliver notifications as they come in generally without delay. But similar to design, some of the major differences rely in the customization and options provided to users for their notifications. Following the same options provided for overall design customization, Glip does a solid job in allowing users to customize their notifications as well. Users can choose to configure email and mobile notifications, as well as desktop notifications, all from the same settings menu. With the option to turn on or off specific mentions for email or mobile, users can choose specifically what function will give them a notification and where, and can even change how often notifications will arrive – specifically for messages posted to your team’s channel. Users can choose to turn on or off email notifications, something I noted in a previous comparison with Slack that is a bit anti-thesis to these apps, yet still incredibly useful. Glip takes it one step further again and offers a “list of what I have to do today” email options, pretty self explanatory. In my testing, between both desktop and mobile notifications, I never lost any and they always came on time. @Mentions to my specific username would also generate notifications right in the app, a nice extra touch. 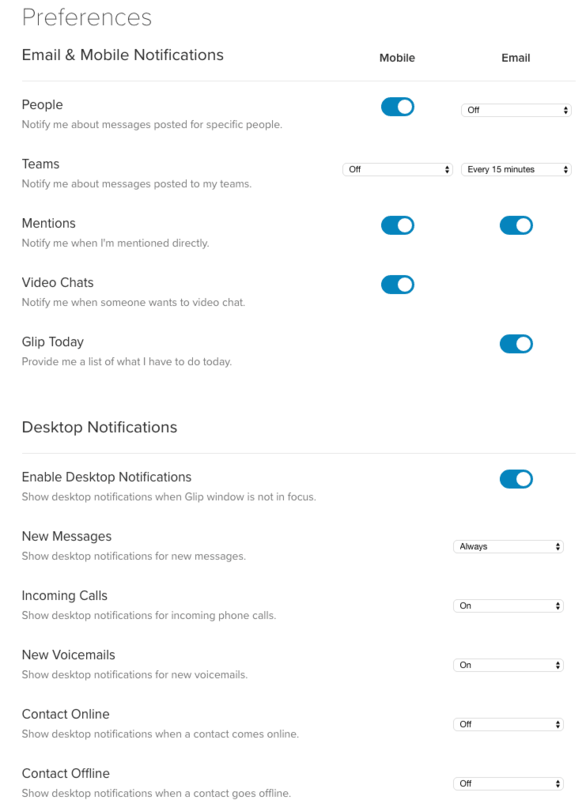 So Glip manages to meet Slack in the middle here, both allow sound customization of notifications, both allow email notifications, @mentions and mobile notification configuration. It’s a bit of a toss up – except for one special function that Slack has up their sleeve, Highlight Words. Now, how useful this will be will come down to your team, and the type of discussions and collaboration that normally happen in your Slack rooms. But to make sense of it, Slack allows users to specify certain words or phrases to ping users whenever they are used in chat. 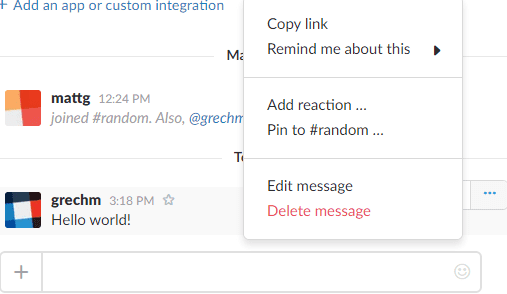 So Slack simply allows for custom notification triggers, even if your name isn’t mentioned. This is just a really great way to stay on top of specific discussions on a project, even if you aren’t directly brought into the conversation. Winner: Slack – Glip is very close on this one, both allow email notifications for when you’re away, but Slack’s custom notification options with Highlight Words is something Glip might want to jump on and include. We have frequently discussed integrations, and their upcoming role in some major UC trends, as well as creating fully connected digital experiences. Integrations are simpler than ever with APIs, and when a platform is missing a feature integrations generally come to the rescue. At a quick glance, Slack is the clear winner when it comes to integrations. With a massive established database to choose from, with custom made bots to popular work application integrations Slack essentially already has everything you need. We even managed to turn Slack into a remote employee command center with some useful integrations. Glip, on the other hand, is a bit new to the scene with as less established hold on integration availability. I do enjoy the inclusion of their Integration database right in the app itself, a really nice user experience addition, and Glip even includes a “let us know what you want” function to help deliver the most needed integrations – so credit where it is due. 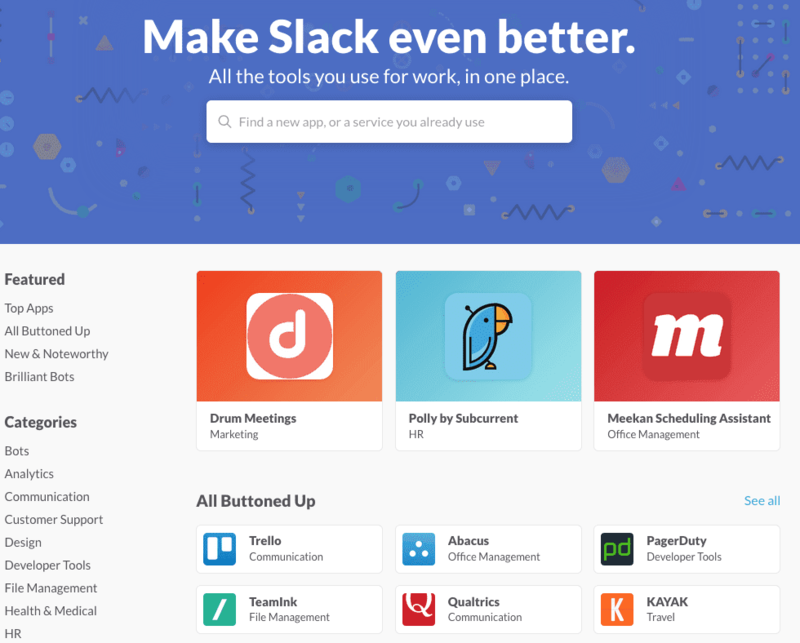 Unfortunately, Slack has a monster directory that just dominates most, if not all, competitors. 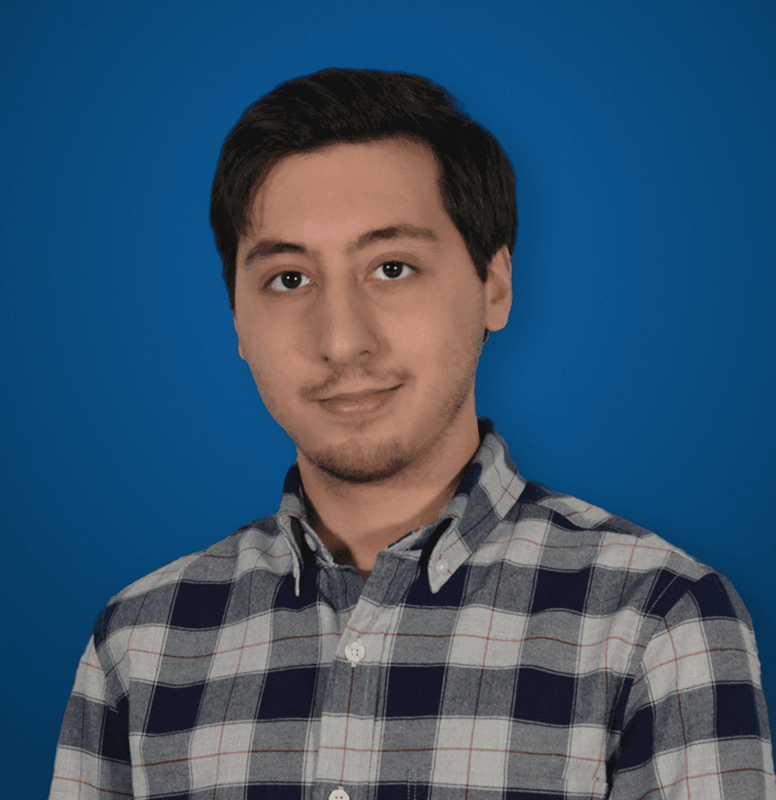 Winner: Slack – With an already massive established directory for not only popular app integrations, but even custom user made bots and task automatons, Glip has a bit of catching up to do. Thankfully, pricing plans for Glip are fairly straight forward, and how much you will pay ultimately relies on what exactly your team will need. Like Slack, limitations are placed on your functions based on what level of service you subscribe to, however Glip seems to lie on the more generous side. Glip offers three different pricing plans, and depending on which your team subscribes to, each plan will expand on both this list of features, and what is included in the less expensive plans. Slack’s pricing is by no means inaccessible, they do of course provide a free plan for teams that want to try out the platform, as well as comparable Standard and Plus plans. However, they are slightly more expensive than Glip, and just a little bit more restrictive in different ways. Broken down into the three plans, Slack provides different feature levels, or rather less restrictions. Winner: Glip – While both expand their platforms in different ways for more expensive subscriptions, Glip continues to offer more for less. Even if you are going free, Slack limits your integrations so the massive database is force shrunk to only 10 additions. Video and voice chat are a very nice addition, and its odd how Glip limits teams but that must have to do with their RingCentral ownership. In the end, both Slack and Glip offer messaging platforms that include more features than most would ever even consider. Slack does messaging and it does it very well. They’ve also become serious about growing the feature set for some time. This includes the recent video chat addition – something we haven’t seen before in our previous comparisons. I’m also sure that one day Slack will grow to include everything you could ever need. With integrations, one could even argue that Slack lets you do everything. But Glip is here, and full of features right now. Beyond just messaging, Glip extends into the realm of task management and collaboration thanks to the built in feature set. A calendar that already integrates with popular options, task management, note and document editing, video chat, unlimited file sharing – its all there and its all living in Glip right now. While I enjoy Slack, and its a great product that fills the need most of us have – for less money you can get even more options directly from Glip. Great comprehensive write-up, and I totally agree with all the points you’ve made. I’ve been using Glip for over 18 months and I feel it’s superior to anything currently out there, I really hope for great things for Glip in this competitive environment.